A group of innovative University of Toledo students has taken the Redbox video kiosk idea and turned it green. The project is attracting national attention and federal research money. The U.S. Environmental Protection Agency awarded the team of UT undergraduate students a $15,000 grant to participate in a national competition to design solutions for a sustainable future. UT students are building the Greenbox prototype for food recycling this semester. The UT team’s proposal is to create a community-based garbage collection system called Greenbox, which turns food waste into energy. To understand the senior design project, it helps to be familiar with the Redbox video rental system. The EPA chose the UT team to compete with more than 30 other university student teams across the country in the 12th Annual People, Prosperity and the Planet Student Design Competition. In the spring, all teams will submit their reports and proposals for a chance to receive an additional $75,000 in grant funding for their project. The United States generates more than 34 million tons of food waste each year, and more than 97 percent is disposed of at landfills, according to Franchetti. 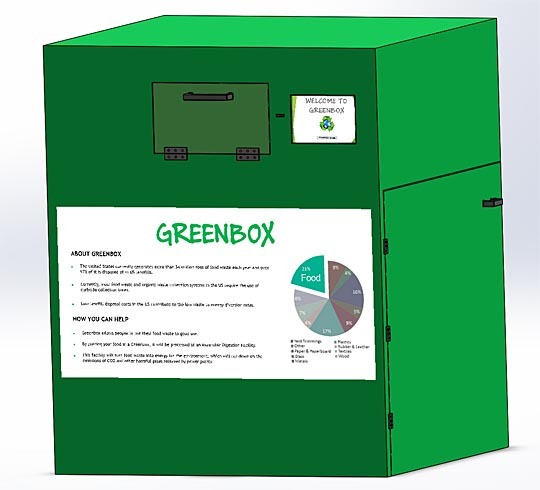 Greenbox would be a recycling option with reward incentives to divert food waste from the landfill. “Greenbox also would reduce the greenhouse gas emissions associated with food waste rotting in landfills and lead to a cleaner environment,” Franchetti said. The UT team said the Greenbox kiosks — standing six feet tall, four feet deep and five feet wide — would be located at convenience stores, fast-food restaurants, grocery stores and pharmacies. Somewhat similar to the U.S. Postal Service automated centers, the Greenbox kiosks would include a touch screen and label printer. Once a kiosk is two-thirds full of food waste bags, a sensor would automatically notify a local hauler that the machine needs to be emptied. The bags would then be transported to a local waste-to-energy facility and weighed so customers could cash in on recycling incentives. This entry was posted on Thursday, February 25th, 2016 at 3:28 am and is filed under Engineering, News, Research, UToday .